Appearance: Tsuchi has long black hair and he only shows his skin when the sun is not out so he has no skin color but a pasty gray.his eyes are purple and his body type is proto type witch is very skinny.he wears a gray flak jacket and long jeans that are also gray. Personality: Tsuchi is very cold hearted and does not make friends easly,he likes to sound cool but he knows that he is just another ninja.Tsuchi has high hopes of being a great ninja.Tsuchi is rather blood thirsty and loves to kill but sometimes he is very spareing to the ones younger than him.Tsuchi is never nervous and Tsuchi loves little creatures because they are defencless against most things.Tsuchi is not easly out spocken and is very outgoing.he has the dominance of a leader and can manipulate the minds of many.Tsuchi enjoys working on dangerous missions because there is a lot of suspence.Tsuchi,among others,respects himself and takes care of himself.Tsuchi is a very calm ninja and a born leader. Clan History: Senju (Thousand Arms) of the Forest were one of the founding clans of Konoha. Under Senju Hashirama, they allied with other clans including the Uchiha, to found the Fire Country's ninja village. It is unknown if Senju retains a clan structure in the current Konoha. Tsunade is the only known living descendant of founding clan of Konoha. Tsuchi was told that he was the most promising child in his clan but he thought otherwise he was small and people made fun of his skinny body type.Tsuchi practiced the earth jutsu before he was a ninja and he was very proud of himself and so were others.but Later his father was killed by his own clan mate the clanmate was killed and Tsuchi still had an empty spot in his life but didn't know how to fill it.Tsuchi tried but failed so he decided to become a ninja like his father. When Tsuchi started school he was at the top of his class and was apraised for his talent with ninjutsu and was almost a master of earth by there standerds but he kept working on them.At age 9 he passed the student acadamy because he was so good that they didn't need to teach him and became a genin.When he was a genin he was paired with two other genin and once again his talent was egnoliged and he was the sqaud leader.on his last mission his sensei died,the funalral was short but he stayed for hours,crying.he was blamed but then he proved it wrong.At age 11 he entered the chunin exames and passed the first and second test without even a flinch but in the third exam he was pitted against his best friend and he was worried that he might hurt him.he fought and killed him.Tsuchi stayed at the funalral and he was not blamed because the student had signed up for the exam and on the paper to sign it said "on this exam you may die or be really hurt".Tsuchi stayed at the funaral site for hours more and he viseted it for days on end.Tsuchi began practicing water jutsu and soon he mastered water and learned wood jutsu of his clan witch he also mastered without failing.Tsuchi soon many friends and he was offered to be a jonin. Tsuchi was exepted as a jonin and was very proud to be a jonin at age 15.Tsuchi wited two years and non of his friends or family were proud so he soon hated all of them and never came out of the clan meditation room.he recently has come out of it and he was in no mood for playing.he almost killed one of his clanmates because he made fun of his pasty gray skin.Tsuchi waited for a cuple of months and he still waits for a shimer of pride from himself but it never happened and he waited for a genin team or an aprentice from this day.Tsuchi's brother raikou was killed and he baried him the killer was the leader of the akatsuki. 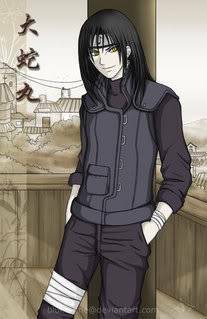 Tsuchi looked at his opponent and smiled "you don't know who i am do you..Tsuchi..Tsuchi Senju and i'm seventeen the hope of the senju clan. "Tsuchi jumped and pulled out his bamboo sword and slammed it in to his opponent.his opponent dodged and jumped higher to branch and said "well do you know who i am..i'm many things but most call me leader of the akatsuki. "Tsuchi looked unimpresed and he swung the bamboo sword again "i don't care who you are you killed my brother and you shall pay for you crime"Tsuchi jumped and hit his opponent with the bamboo sword across the face but after his opponent diapeared "NOOO!!!! "Tsuchi yelled.Tsuchi went back home and baried his brothers body. "i'm sorry raikou i coulden't save you..he was to fast"Tsuchi cried for his fallen family member and he made a tombstone of wood that said "here lies Raikou Senju"Tsuchi went inside and he stayed for three days the he came out into the light,he had moved on. (part of the leaving arc aswell)Tsuchi travled to the land hidden in the mist first and gathered ninja tools such as kunia,shurikin,ect. Tsuchi also louded up on food.Tsuchi then travled ,on foot,To the sound village looking for the village of the moon.Tsuchi found the bear village then he saw a great big moon and he followed it and it led to the hidden moon village.Tsuchi looked all over the village before finding it in the forest because one of the members had been folish enough to drop an akatsuki robe outside on the ground. Thsi is a good start but there a a few things that you're gonna need to edit before I can approve you. 1. The Senju clan does have a clan symbol and it has a history too. Try this site to get ahold of this info and then put it into your application. 2. Sorry, but no Senjutsu (Sage Techniques). I know that's not under the banned list, but I forgot to add them, sorry. You may have one Main and one Sub of the following: Ninjutsu, Genjutsu, Taijutsu, Fuuinjutsu, Puppetry or Weaponry. 3. Bloodline (Kekkei Genkai) techniques almost always have ranks though they aren't as easy to find. Again, try this site - go to Ninjutsu and in the list are all the Mokuton techniques you mentioned. 4. In your history there is one thing you ought to explain (by adding to this section). He killed his friend but was not blamed - how come? After these small edits, I can approve you. Tsuchi lookes the same only he has an akatsuki robe on.he still wears the black flak jacket underneith. Description:Suiton • Mizurappa is a Ninjutsu technique utilizing the Water Element. After forming the needed handseals, Yahiko will expel a strong jet of water at his opponent. Description:Sanjuu Rashoumon is a Ninjutsu summoning technique utilized by Orochimaru. One Rashoumon gate alone was said to be his ultimate defense, with this variation he can summon three of the gates in succession to help block a great incoming blast. Because the gate requires two summoning calls (a right and left), he will bite both his right and left thumbs to initiate the contract. Description:Genryuu Kyuu Fuujin is a Fuuinjutsu technique utilized by Akatsuki. To further their goals, they seek to capture all the "jinchuuriki," literally "the power of human sacrifice" a.k.a. demon possessors such as Uzumaki Naruto and Gaara. Akatsuki seeks to use the bijuu (tailed demon beasts) for their unique abilites. Once they capture one of the jinchuuriki, they will bring them to a hidden location. All nine members need not be physically present, they can use their astral projection technique to transport a spectral form of themselves into the cave. The members will first summon the huge "king of hell" statue. This statue has its mouth bound and eyes covered. Once they begin the technique, the mouth binding will fall away and nine spectral dragons will emerge from its mouth to strike the jinchuuriki. This will then begin the extraction process. With the absence of Orochimaru, the process will take three straight day and nights. During this period the members will release the same exact amount of power as that of the bijuu, this synchronization will thus allow its removal. As the extraction continues, the statues eyes will open to reveal the current status of previous jinchuriki captures, with irises appearing in the eyes to apparently represent a capture. Description:Fuujutsu Kyuuin is a Fuuinjutsu technique used by Pain to absorb the substance of incoming attacks. This seal will absorb both plain chakra and elemental attacks. He does this by reversing his chakra flow to draw the external attack deep within his body and nullify it. Description:Mokuton no Jutsu, the act of using the Wood Element, allows the ninja to manipulate and conjure tree and wood at will. The wood will grow and bend at the ninja's will, taking whatever form he needs. This element is formed through the simultaneous usage of the Earth and Water Elemental styles. Description: Kawarimi no Jutsu is a basic Ninjutsu technique. When in danger the ninja will quickly substitute themself with another nearby object. This can be a block of wood or even another person. This allows the ninja to quickly flee and hide while the original object takes the brunt of their opponents attack. Description: Mokuton • Daijurin no Jutsu is a unique Ninjutsu technique used by Yamato. Using his ability to utilize Mokuton (wood release) techniques, Yamato will extend a large mass of spikes from his arm. These spikes can act both to impale his target and as a barrier to protect a comrade. Description:Mokuton Hijutsu ~ Jukai Koutan is a Ninjutsu technique unique to the First Hokage which uses the Wood Element. The First Hokage does the necessary hand seals and a dense growth of forest and branches grows from the ground to entangle his target. Description:Mokuton • Moku Shouheki no Jutsu is a unique Ninjutsu technique used by Yamato. Using his ability to utilize Mokuton (wood release) techniques, Yamato will form handseals and cause beams of wood to emerge from the ground. The beams can converge to form a half spherical barrier to deflect an incoming blast. Mokuton • Henge is a unique Ninjutsu technique used by Yamato. Using his ability to utilize Mokuton (wood release) techniques, Yamato will form handseals and cause beams of wood to emerge from the ground. The beams will converge around his body to form the shape or individual he wishes to transform into. Unlike regular Henge which just transforms ones appearance, Mokuton Henge creates a physical material to hide ones appearance. This technique works best when the copied person is at least partially made out of wood. Description:Mokuton • Shichuuka no Jutsu is a unique Ninjutsu technique used by Yamato. Using his ability to utilize Mokuton (wood release) techniques, Yamato will form handseals and cause beams of wood to emerge from the ground. These beams will converge and combine to form a dwelling of his choosing. This dwelling will resemble a normal home, with rooms and doors on the inside. In essence the technique allows Yamato to conjure a home from nothing, and not even have to summon it. Mokuton • Shichuurou no Jutsu is a unique Ninjutsu technique used by Yamato. Using his ability to utilize Mokuton (wood release) techniques, Yamato will form handseals and cause beams of wood to emerge from the ground. These beams will converge and combine to form a prison. In essence the technique allows Yamato to conjure a prison from nothing, and not even have to summon it. Description:Doton • Doryuu Katsu is a Ninjutsu technique utilizing the Earth Element. The ninja will do the necessary hand seals, then place their hand to the ground. This will cause the earth to rise up and split apart. Once the ninja removes their hand from the ground, the earth parting will end. Description:Suiton • Suijinheki is a Ninjutsu technique utilizing the Water Element. The ninja will first do a string of hand seals and then proceed to blow out a jet of water from their mouth to act as a water barrier from incoming attack. Description:Doton • Doro Gaeshi is a defensive Ninjutsu technique utilizing the Earth Element. After striking the ground with their hands, a large wall of earth will rise into place as defense. The defense is not perfect though, a hard or drilling impact can puncture the wall. Description:Doton • Doryou Dango is a Ninjutsu technique utilizing the Earth Element. After striking the ground with his hands, Jiroubou is able to overturn the earth into a large dumpling shape chunk of earth the size of a mausoleum. Using his immense strength, he can lift up the ball and hurl it at his opponent, flatening all in its path. Description:Suiton • Goshokuzame is a Ninjutsu technique utilzing the Water Element. Kisame will form the needed hand seals and then place his hand to the surface of the water. A shark of condensed water will emerge from each of his fingers to attack his opponent who is in the water below. Leaving arc:Tsuchi left the village because he did not fit in well and he didn't have a sqaud. Tsuchi decided to find the akatsuki hidding spot and he found it in the far west of the moon country.Tsuchi chalanged the leader one on one .Tsuchi killed him with his brothers blade and was saticfied.Tsuchi was noticed by the other akatsuki members and he was decided to be an akatsuki member.at first he told them he would sleep on it.The next morning they were all hiding.Tsuchi looked around the corner and found the dead body of the akatsuki leader and took his bloodstained robe and put it on and he stode in a podium. He told them "Fello akatsuki i will take this job with pride and dignety." Tsuchi looked at the akatsuki members and one of them handed him a new akatsuki robe and a hat.He had become a member.Tsuchi shone his new wear proudly to people of the moon village.Tsuchi killed and entire village and was not captured.Tsuchi decided to actually do something with the akatsuki. Tsuchi never really decided if he was going to do something about what the akatsuki did.He thought about things till he came up with take bover plans. "First we cause a great war between all the hidden villages then when there numbers are down we may take over the villages." All the akatsuki members agreed and they set to work but soon the moon village was raided by Sunagakure ninja and all the akatsuki members were killed exept Tsuchi who killed most of them and then the others ran away.Tsuchi felt no loss or gain but he is know looking for akatsuki members.Tsuchi's plans were ruined and he didn't have anyone so he decided to be his own leader for know. Hello there! I'm glad to see an application has cropped up, though it does need a bit of work. To begin with, your most recent post shouldn't exist. You should copy your most recent post and add it to your original application in the proper sections. On a side note, you should not make 4 consecutive posts in a row (special exceptions for updates on announcements and for adding things if the post is to big), instead just edit the original posts. ok sorry about the four posts and i only put that ther because it woulden't fit on my app i'm sorry about those other posts.that and i can't delete the four posts >.< sigh sorry genesis and i know you from either ingoo or from Ultimate shinobi. Understood, I was just informing you. I'm from both, thank you for noticing. Well Genesis got to this before me and ditto about the quadruple posts, lol. So, Akatsuki Leader. You're going to need a much more detailed history (for example, not just accepting the leadership by almost pure chance - it needs a decent story to it). You'll also need a much longer personality. I'm also a little iffy about Edo Tensei. If you can remove it for now and I'll discuss it with staff to see what others think about it's power level. Fuujutsu is iffy if you ask me. It basically makes you completely invulnerable. If we could tone it down, or make it so that you can only use it in a thread where you don't use any other non-basic jutsu, I think we could keep it. I'm not sure about Edo Tensei either, but I think that as long as we monitor it and the corpses always disintegrate in the thread they are created then it would be okay. fixed and some of the fuuinjutsu like the bijuu removle thing thats an akatsuki must for taking over the world.That and the absorb thing i can only do that once per thread or the others are just for stationary. The problem with Edo Tensei is that it requires a human sacrifice for each ressurection. So two ressurections = two sacrifices. Where will they come from? We can't just have random NPC sacrifices. Power-wise, I think a restricted version is fine, but the sacrifices are what bothers me most. I don't have a problem with the Absorbtion technique, so long as it is only used once a thread. Remember that you still need to perform a good number of hand seals before using it. Lastly, the Bijuu removal technique you can have by all means, but we don't have Bijuu on this forum. You still need a more detailed RP sample. EDIT: I've had a think. Once the above is sorted I will approve you as an Akatsuki member, but will wait for some more Akatsuki before deciding upon a leader - it only seems fair as there is currently little competition for such a highly-regarded position.